Oh my! Where do I even begin? This past weekend marked the one-year anniversary of One Fine Day. I promise I won't get overly sappy, but there's gobs to be grateful for -- especially you! It all started with this inaugural post. And since that lonely Friday at Lil' Puna, the header and fonts weren't the only things that changed -- I'm different as well. Just as I'd hoped, this was exactly the creative outlet I so desperately craved. I've created a forum to express myself, and in the process a tight-knit blog community has evolved. It's given me the opportunity to converse and connect with other creative types who've inspired me to dream a little bigger. I'm not sure what's in store for dear ol' bloggie, but I'm forever thankful for your support. 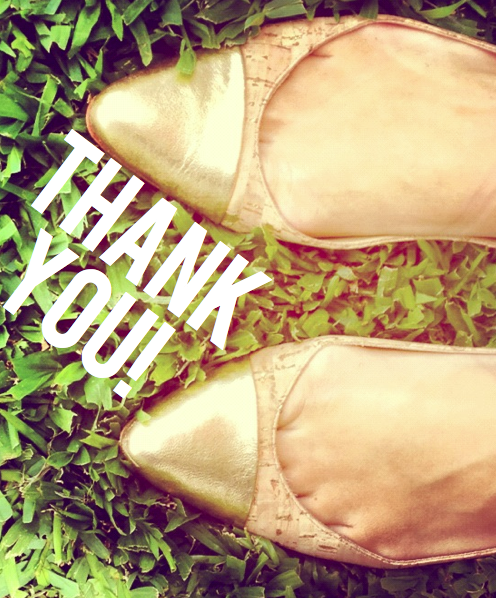 You stop by often, occasionally comment, and drop a line via email -- you've been a snazzy and sparkly support system. From the bottom of my heart, thank you! To show my appreciation, I thought I'd host a little giveaway. Eek, I just knew you'd be excited! What? You say your enthusiasm is through-the-roof. That's amazing, because I feel the same way. I'm squealing with giddy delight -- Sophia Grace and Rosie style. The blogaversary giveaway is just SO GOOD! Haven't a clue what I'm talking about? Watch this clip and stat. Stat means now! Now, back to the giveaway... Dorothy Parker once quipped, "I've never been a millionaire, but I just know I'd be darling at it." My sentiments exactly. I wish I was a millionaire, so I could gift each of my readers with something fabulous to say "Thanks." While I'm no Oprah, this is a chance for me to give away some of my favorite things -- just a few items that make the "A-List." 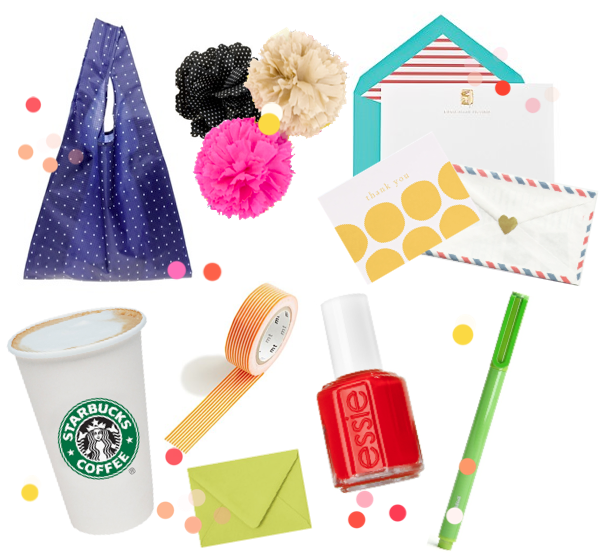 Five lucky readers will win a Type-A(shley) gift box filled with all sorts of amazingness like a Baggu bag, pom-pom flower pin, oodles of stationery, nail polish, pens, washi tape, and a cup of coffee (my treat!). These are all little things that make this gal incredibly happy! What's on your mind? Tell me what sorts of topics you would like to see discussed. What do you want more or less of around here? Share feedback in comment section below. Complete all three entries, and you'll be entered three times. Yahoo! Each entry counts as one separate entry! All five winners will be announced on Thursday, June 21, 2012. Be sure to check back and see if you're one of the lucky recipients. If you're looking for an in to win, you'll have to sweet talk Random.org. Best of luck! Now go get 'em! *Note: This giveaway is not affiliated with any of the stores or brands listed above. The contents have been purchased solely by the blogger with the intent to be gifted to the giveaway winners. I would be interested in how to create a budget. So, I can buy what I like and still have some saved up. I am a follower through GFC and twitter! I love when you do the "lurve lists" you always find the neatest products so I'd love to see more of that! Congratulations! Your blog always brightens my day, so thank you very much! Congratulations! Such an exciting milestone. I follow via Google Reader but just added myself via Google Friend Connect! Fingers crossed! Aw, it's been a year already?! Congratulations! I've enjoyed reading your blog so much; it has been a great way to stay connected. Miss you, and here's to another great year ahead! I enjoy all of your posts, especially ones with roundups of products or spotlights on trends. I also enjoy posts about life in Hawaii. Would love to see more posts showing how your style translates to home design (not necessarily with your own home, but examples of designs and products you like). I'd love to see home decor ideas. Congrats Ashley! So exciting to have one year under your belt! What a fun giveaway to go with it! SO proud of you Ash! It's been fun to be here since the beginning and see your talents, gifts and passions collide in the blog-o-sphere! Love your posts - love the finds you find! :) Hmm... more of life on the island or your home organization/decor, etc! I love that you have stayed true to you! You never stray from polka dots, Kate Spade illustrations, or your reality TV lurve. It's so easy to feel the love you have for doing this, and for that - I give two snaps in a z-formation! 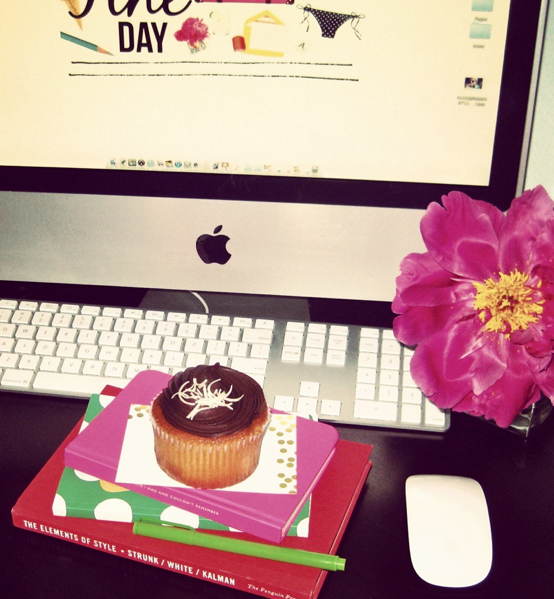 Happy 1 year blogaversary!!! 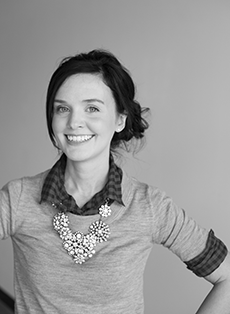 I'm so glad you found your creative outlet because we all love your blog! 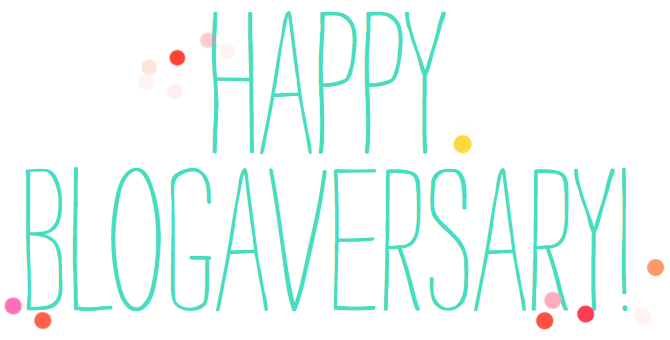 Happy Blogaversary! I am so happy to have found your lovely blog. I'd love to see some more of your Lurve Lists, organization and fashion tips. I also follow your blog and follow on twitter! I love your blog - huge congrats on the awesome content day in and day out. I'm connected via GoogleFriend. And as far as what's on my mind - I'm really loving the new series where you feature other bloggers, and I would love to see more style/product boards - those are always a favorite. 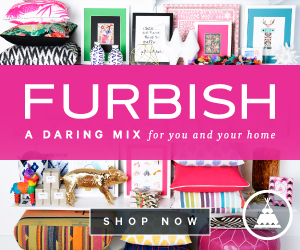 I follow you on BlogLovin' and GFC. Happy Blogaversary! Love your posts! I always find reading about your day-to-day very interesting! It's funny how ordinary everyday life can seem too normal or ho-hum to the person living it, but it's really interesting to anyone else (because it's new to us). Does that make sense? I follow you via my google reader and don't miss a post! I'd love to see more photos of your casa and maybe some posts about your workout routine.m I know you spin, but do you do it at home or the gym? Maybe more photos of your personal stationery collection... ? Promise I'm not brown-nosing here- but really love what you're doing so far with you blog, wouldn't change it. You've always got great graphics, fonts, and colorful clear pictures, LOVE! Following (via Reader-that counts right?) And i love the sophia grace and rosie mention! They're like a youtube wormhole all by themselves- You can't watch just ONE SG&R video. You must watch them all! And then you start thinking a tutu would be a good idea...I'm rambling, happy anniversary! And Finally: Honestly as far as content, I love bloggers who just write about stuff they like. So 'Favorite Things' posts (even though we may not be Oprah) are always golden. Congratulations on your blog anniversary! I follow you via Google Reader! Well, I don't want to totally copy Renee but I agree with her - I love seeing "favorite things" type posts, and especially "daily carry" things (ie. what's in your bag) that kinda thing! What a rad giveaway! Hope I get lucky! Already following you! :) How could I not be? I loved your Matilda post- maybe more like those!? Either way, your blog is brilliant! I think the blog is pretty fantastic as is. The graphcs and layouts are spot on. Maybe a bit more about your day to day? or how to translate the trends into more classic pieces? I'm a new follower of your blog. Looking forward to your next year! I am a new follower of your blog. My girlfriend Carlie introduced me to One Fine Day! xoxo YEAH!! Happy Congrats!! I am a stalker err I mean follower! yay! yay! yay!!! such a tremendous thing to celebrate & what a LOVELY giveaway!! Shared the link on facebook. Also repinned on Pinterest! Love this blog! I love all your style ideas and love checking out your cute ideas everyday! Feedback-love it all! I want to see more "what's in your purse" posts-love those! Also, love to see your music favorites! You fancy, huh? You know I'm a follower! And I bragged about you on the Facebook! Can't believe it's the bloggie's bday! Can feedback include glowing compliments? My fandom is obvi, and I'd love to see more of your Puna decor. How to create a great office space maybe?? Congrats Ash! What a milestone! I love all of your random things & great finds. And when you gab about your favorite celebrities! The composition of your posts (colors, images, etc.) are wonderful. Congrats! Would you ever consider posting a little more about Hawaii??? I just love your darling little blog! It's so colorful, happy, and just plain fun. We need more of that nowadays! I've been a follower for a while now and just wanted to wish you a Happy Anniversary from St. Louis! I'm so glad I discovered your blog just in time for a give-away! You are like Oprah! Following! I loooove your lists! I especially like The Tuesday Ten. I would like to see more lists on the blog. Sometimes I hate FB (it deleted my most awesome post), but I love your blog. I've shared and tweeted (@cmichellewitt), and about your blog? I love the lists. I stop by most everyday, except lately...have had a lot going on; but your blog motivates and inspires me in so many ways. Miss you much! !